Thanks to its labyrinthine streets and impossible canals, Venice is one of the world’s easiest cities in which to get lost. But with a bit of research, it is also the easiest town to understand. From a bird’s-eye view, Venice is made up of two central islands that look like intertwined hands. Neighborhoods, called sestieri, subdivide the islands into six characteristic areas, which range from busy marketplaces to quiet communities. Here’s a look at each of these distinct sestieri. Traverse the wooden Accademia Bridge to arrive in Dorsoduro, known for its charming artsy vibe thanks to a mix of families and university students. Its beautiful palazzi and campi (squares) are picture-perfect, and the area is peppered with bars, galleries and restaurants. The southern neighborhood spans from Punta della Dogana, the old customs building at the very eastern tip of the island, to the Port Authority in the most southwestern edge and includes Giudecca, the long residential island immediately to its south. Sites not to miss: Gallerie dell’Accademia, Peggy Guggenheim Collection, Il Redentore, Campo Santa Margherita, Chiesa Le Zitelle, Punta della Dogana, Santa Maria della Salute. Named for a former fortified palazzo, Castello is the largest of the six sestieri and the greenest. Its western border lines up with the edges of San Marco and Cannaregio, so expect a bustle of tourists and souvenir shops. Head east down the calle and along canals; the farther afield you go, you’ll find Castello becomes a charming microcosm where the tourist flow trickles down to a near standstill. Eventually, the eastern half of Castello becomes a large public garden and shipyard — the Biennale Giardini and Arsenale — home of the annual La Biennale festival. The cemetery island San Michele is also part of Castello. Named for the city’s patron saint, San Marco is the most visited of all Venetian sestieri. The sestiere’s heart is Piazza San Marco (St. Mark’s Square), the number-one destination for all visitors to Venice. Here you’ll find tourists taking photos of the inimitable Basilica San Marco or enjoying a spritz at the square’s historic cafés. The San Marco neighborhood spans from the Rialto Bridge to St. Mark’s Square, so once you’ve visited the piazza, head deeper into the neighborhood. 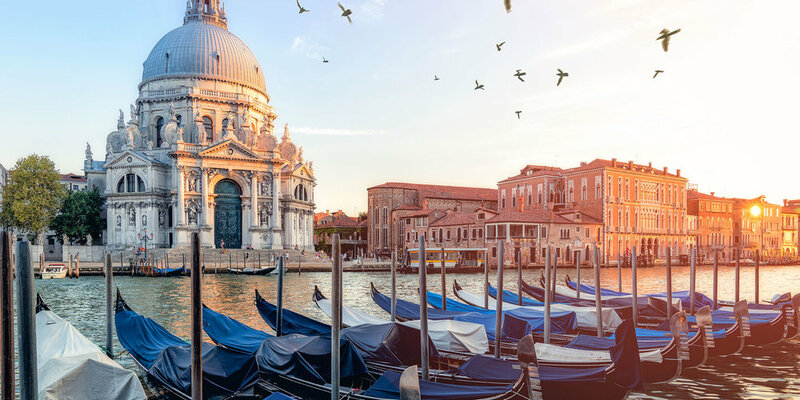 Wander past small-scale piazzas and peek into lavish museums, and keep an eye out for waterfront photo ops across the lagoon to San Giorgio Maggiore island, also part of sestiere San Marco. To many, this tiny sestiere is the heart of Venetian life. One of the oldest neighborhoods in Venice, San Polo is a dynamic neighborhood filled with families, shops and students who all seem to converge on Campo San Polo, the second-largest square in Venice. San Polo is also a thoroughfare for tourists walking toward San Marco after visiting the Rialto market, the historic and picturesque fish market. Sites not to miss: San Giacomo di Rialto, Santa Maria Gloriosa dei Frari, Grande Scuola San Rocco, Campo San Polo. Cannaregio is the gateway to Venetian life. Starting from the steps of the Venezia Santa Lucia train station and extending eastward on the famed Strada Nuova to the Rialto Bridge, Cannaregio is a vivacious sestiere of boutiques, restaurants, squares and palaces. The wide Strada Nuova is a busy shopping promenade, while its side alleys lead to niche communities like the Jewish Ghetto, which dates back to the city’s original 4th-century Jewish settlements. Fondamenta Nuova, the northern edge of Cannaregio, connects to the island of Burano via vaporetto (boat). This sestiere is said to have a dual personality. The southwestern area of Santa Croce is a transport center, with Piazzale Roma as a hub for buses and taxis. Its northeastern area is more typical of Venice, filled with canals and alleys lined with historic palaces. Though tiny, Santa Croce packs a cultural punch with lavish architecture ranging from Byzantine to contemporary. This article is part of a series which appears Venice travel for Marriott Bonvoy Traveler. 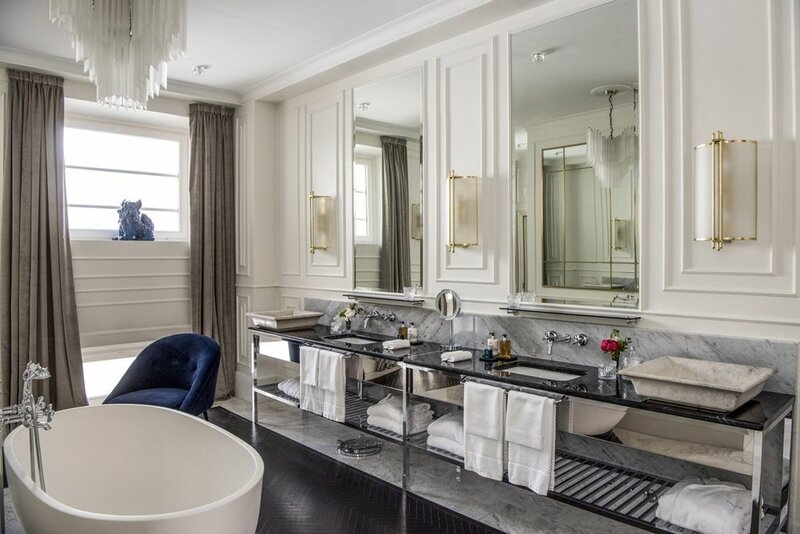 This article first appeared in Marriott Bonvoy Traveler, March 2019. With 118 islands making up the Venetian archipelago, there is far more to see in Venice than St. Mark’s Square. Whether an afternoon or a weekend affair, island hopping is the best way to get to know Venice and its 1,500-year-old culture. Here’s a guide to some of Venice’s most must-see islands. The emblematic San Giorgio Maggiore is one of those islands that is always photographed but rarely visited. Dominated by the San Giorgio Maggiore church, a multilevel marble landmark designed by Renaissance phenom Andrea Palladio, San Giorgio Maggiore seems to float impossibly in the middle of the Venetian lagoon. Today, exhibition spaces Le Stanze del Vetro, a former boarding school, and the Fondazione Giorgio Cini showcase contemporary arts projects, while the rest of the island remains green — impeccably pedicured gardens hiding mazes and more. For centuries the tiny island of Murano produced the world’s most beautiful glass pieces behind closed doors. Its reputation seeped out of the lagoon, and now Murano is the most popular of the Venetian islands. Master glass artisans open studio doors to give tourists a select glimpse into their secretive workshops with organized, behind-the-scenes experiences at historic fornace (furnaces) like Seguso. The key to best experiencing Murano is to get past the souvenir shops and explore deeper into the island. 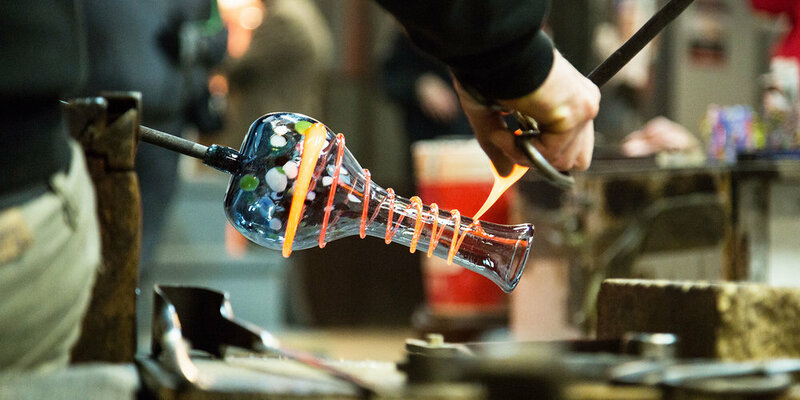 Visit the Museo del Vetro to learn Murano’s glassmaking history. Of all the Venetian islands, Burano is the one most remembered. Here visitors find a mini version of Venice, with a rainbow of brightly colored houses lining picture-perfect canals. Burano, like most of the outlying islands, is a microcosm of locals who have grown up with one another for generations and for generations have been making its famous lace products by hand. The Museo del Merletto (Lace Museum) chronicles Burano’s more than eight centuries honing lace craftsmanship. Linked to Burano by the Ponte Longo, a wooden bridge, Mazzorbo is a quiet island of less than 400 inhabitants and was once an important political and commercial scene in medieval Venice. Mazzorbo’s draw today is that in the midst of Venice’s tourist-laden streets, it remains untouched and out of the way of clutter and kitsch. Charming residential areas line up with stretches of cultivated land, including vineyards such as Venissa, a walled-in vineyard reviving heritage dorona di Venezia grapes. The 13th-century Chiesa di Santa Caterina, the island’s last remaining church, has a bell tower with one of Europe’s oldest bells and is also worth a visit. Within a gondola ride from the fondamenta nuova, Venice’s northern waterfront, you’ll find the mysterious San Michele. Beautifully landscaped with tall cypress trees and surrounded by a pedicured redbrick wall, San Michele has served as the city’s official cemetery ever since a Napoleonic decree banished burials from Venice churchyards. Serene and tranquil, San Michele is the final resting place for Venetians and famed outsiders, including American poet Ezra Pound, Italian painter Emilio Vedova and Russian composer Igor Stravinsky. Everybody loves Lido, the large Venetian island best known as the home of the Venice Film Festival, the august cinema fest where the world’s best directors and actors celebrate their films. What most people don’t know is that all year round, Lido remains a charming community of families. The seven-mile-long Lido is also a jewel box of art nouveau and art deco architecture — including villas, hotels and ornamental gardens. In the warm months, Venetians from all over the islands head to Lido’s stabilimenti balneari, beautifully coiffed and colorful waterside establishments on the island’s six miles of uninterrupted beach. Located on the northern edge of the lagoon, Torcello is one of the most remote islands in the Venetian archipelago and the oldest that has been continually populated — in fact, its origin story predates Venice. Once a busy settlement, today Torcello is sparsely populated. What remains from its resplendent past are a few structures, including the seventh-century Cathedral of Santa Maria dell’Assunta with its beautifully preserved Byzantine mosaics and a head-spinning bell tower that overlooks Burano. It’s definitely the place to clear one’s head. The only way to travel the islands is by water. A network of vaporetti (waterbuses) zigzag the Venetian Lagoon, connecting the islands. The best option is the ACTV tickets offering unlimited travel within a 24-hour period at 20 euro. Less economical and far more efficient is a motoscafo, a sleek, wood-paneled water taxi, which can privately arranged through Consorzio Motoscafi. This article first appeared in Bonvoy, March 2019. Venice is magic: a floating city caught up in the waves of modernity yet resisting the undertow of about-face change; a mind-bending, misleading labyrinth that always brings you to exactly where you didn’t know you wanted to be; and an interactive time capsule that manages to place you in 21st-century Italy and the 15th-century Venetian Republic at the exact same time. It is a beautiful contradiction and a rebellious landscape of countless canals, narrow calle (streets), romantic palaces and wide-open campi (squares) where nothing is ever what it first appears. Since it’s just as easy to fall in love with “La Serenissima” as it is to get lost, here are our top 10 things to do and see in Venice. St. Mark’s Square is Venice’s iconic landmark. 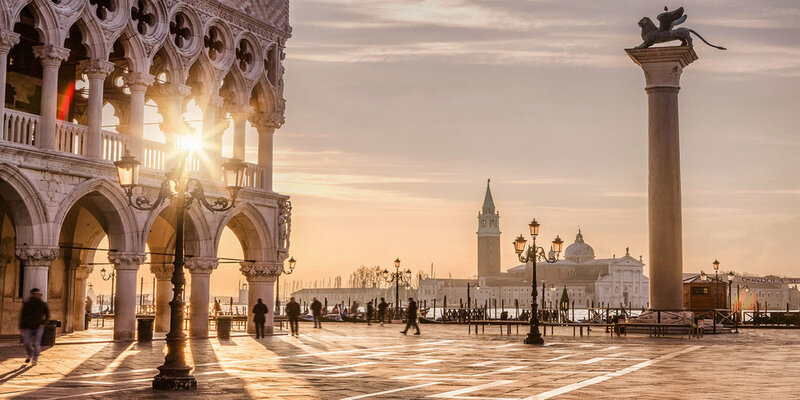 It’s a vast piazza lined on three sides with 15th-century palaces and the beautiful Italo-Byzantine St. Mark’s Basilica on the fourth, and just standing in the middle of the square will give you an idea of the incredible riches and power of the former Venetian Republic’s heyday. But as any Venetian knows, viewing the city is really all about perspective. It’s not about how you stand, but where you stand. 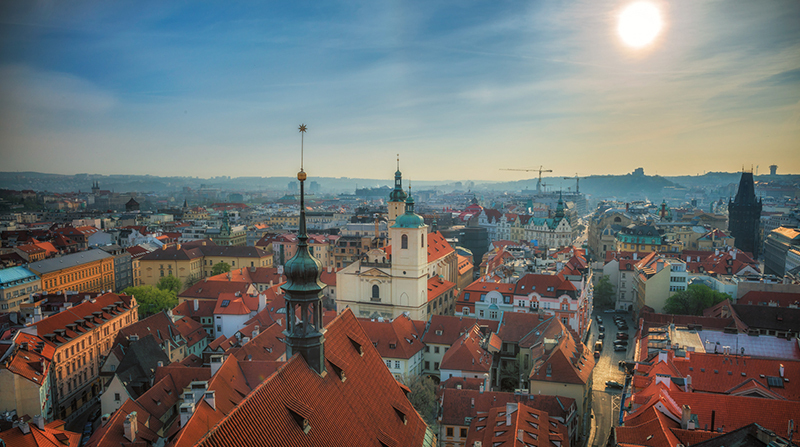 Climb the Campanile, the 320-foot free-standing bell tower in the Piazza’s southeastern corner, possibly the city’s best perch for a bird’s-eye view of the square and surrounding islands. For a little less effort, head to the Basilica’s balcony for a center stage view into the piazza. Pro tip: Avoid on-the-hour visits or those bell tolls will drive you out of your mind. Just behind the Campania, and facing the open waters of the Venetian Lagoon, is the Palazzo Ducale, the residence of the Doge, the chief magistrate and leader of the Republic of Venice. For 400 years, the Doge’s Palace was the seat of Venetian government, as well as command center for all trade and commerce across the Mediterranean waters. The palace’s Gothic exterior hides a labyrinth of rooms, from residence halls and courts to prisons and torture chambers. And this is where Casanova allegedly was held until his victorious escape. Pro tip: Skip the queue and sign up for a private tour of the Secrets of the Doge’s Palace. Considered one of, if not the, prettiest bookstores in the world, the Libreria Acqua Alta (Bookstore of High Water) is a whimsical secondhand bookshop tucked away in a back alley of Castello sestiere(district), which you can enter on foot or, more interestingly, by boat. Its number of overstuffed rooms are stacked wall to wall with books, magazines, maps and other ephemera placed in shelves, bathtubs, bins and even a gondola. Pro tip: You can wind your way through the Castello sestiere to get there or sneak in the back entrance — reachable by gondola — only if you take a water taxi. Venice is an archipelago of 118 small islands, each with its own distinct personality. If you want to avoid the throngs of tourists visiting Murano (known for its glass blowing), you’ll find that just a 40-minute water bus ride from San Marco is the city’s most colorful isle, Burano, which is known for its vibrantly hued houses — a patchwork of colors that brightens up any day and Instagram feed — as well its centuries-old traditional lace work. Pro tip: Make like a local and head to a Burano bakery and ask for a bussolà, a donut-shaped cookie typically flavored with vanilla, rum or lemon. Venice’s secrets are usually hidden in plain sight; you just have to know how to find them. Head to Palazzo Contarini, and along the way meander the side streets of Rialto, near Campo Manin. You’ll eventually arrive at an ornate palace showcasing Renaissance, Gothic and Byzantine styles, with an external tower attached to the facade, vaguely reminiscent of Pisa’s famous tower. The elaborate arcaded tower is actually an open-air spiral staircase, or bovolo (Venetian dialect for “snail”), and after walking up the 80 steps to a domed lookout, you’ll have a private view of the rooftops of Venice. Pro tip: Bring a camera; the bovolo is decidedly Insta-worthy. Venetians have fine-tuned snacking to an art form. Across the city are tiny bacari, typically rustic wine bars where, for a few euros, you can enjoy a glass of local wine with a taste of the owner’s cicchetti(delectable, homemade snacks) while standing at the bar. Essentially, it’s Venice’s clever and very delicious version of wine tasting on the go. The idea is to enjoy a few glasses and taste a few snacks while catching up with friends and then move on to the next. Pro tip: Save your appetite for Cantinone Gìa Schiavi, an 80-year-old outpost in the university-area Dorsoduro noted for incredibly creative crostini and cicchetti. Every two years, Venice becomes the global center of contemporary art with La Biennale di Venezia, a six-month-long art fair that takes over the Biennale Gardens and Arsenale shipyard and spills across the island with arty events. Pro tip: Bring a great pair of shoes and plan to dedicate at least two days to art hopping. There is nothing quite like exploring Venice by water, but with daytime traffic from tourists and local deliveries, the very best time to catch a true sense of the floating city is in the evening. Venice’s gondoliers are ubiquitous, standing at the sides of canals in their striped blue (or red) shirts, black pants and white sneakers. It’s easy to catch off-duty gondoliers looking for their next ride. Before you go, check out Gondola Venezia, which details prix fixe daytime and evening rates; gondolas can accommodate up to six people. Pro tip: Avoid the San Marco area and look for your gondolier at Ca’Sagredo (sestiere: Cannareggio) or Campo Dei Frari (sestiere: San Polo). The Rialto market in San Polo sestiere is one of Italy’s most historic and unforgettable fish markets. Built in 1907, the neo-Gothic loggia has been shacked up with vendors selling their wares for more than a century. Of course, time doesn’t stand still, and though Rialto remains a vibrant fish market scene, bars, restaurants and boutiques have taken residence. Pro tip: Take a seat at the market’s canal-facing bars and enjoy an afternoon spritz. You can thank a 15th-century confraternity — a group of religious laymen — for funding the creation of a literal wealth of Venetian art. Scuola Grande di San Rocco, as this well-funded brotherhood is still known, commissioned La Serenissima’s favorite painter, Tintoretto, to create a masterpiece of Old Testament and New Testament scenes within their headquarters. And he did. After 27 years in residence, Tintoretto left the buildings of the Grande Scuola in San Polo almost entirely adorned in his inimitable, monumental paintings. Pro tip: Tintoretto also decorated the adjacent church, San Rocco. Enjoying Monte Bianco from Le Massif. All photos by Erica Firpo. Italians are lucky. Aside from amazing food, architecture, design, fashion and art, Italy has incredible geography within a drive from the cities: beaches, countryside, hilltops and mountains. And oh those mountains… approximately 40% of the country is mountainous whether its the peaks of the Alps, the smooth crests of the Appennines or the crazy slopes of an active volcano Mount Etna. Skiing is more than just a pastime, it’s a integral part of Italian culture. Each year, school kids get off for a settimana bianca (white week), and almost annually Italians queue the cinemas to catch the latest Vacanze di Natale film, a groan-inducing comedy series that usually takes place at an Italian ski resort. Even though I hate the cold, I love ski culture. There is nothing quite like the vibe of a settimana bianca or white weekend, and Italians know it. It’s all about good skiing, fun friends and great, territorial food in the mountain chalets. Year after year, my friends head back to the same white peaks that they’ve always gone to, but each year, we try to test out a new location. Last year, I fell in love with Courmayeur, and I think it’s time for a weekender. Courmayeur. It sounds French, right? Nope, Courmayeur is 100% Italian. The quaint Alpine hamlet is located in Italy’s most northwestern region, the tiny bilingual Italian/French Valle d’Aosta, most famously known for Hannibal’s incredible overland march, bringing elephants through Valle d’Aosta’s Little San Bernard pass in the 3rd century BC. Meanwhile Courmayeur is considered to be Italy’s best kept winter secret, Picturesque to perfection, Courmayeur has been a travel destination for over a century. The town is a labyrinth of cobblestone-laden streets, vintage architecture, historic coffee shops, busy ski shops, centuries-old churches and gorgeous contemporary boutiques and chalets. It is where Italy’s very mountain guide society (and the second in Europe) was founded but most importantly, Courmayeur has the honor of being overshadowed, literally, by Europe’s highest peak Monte Bianco. Punta Helbronner is hella high. At 15,777 feet above sea level, Monte Bianco is incredible. And incredibly cold. Sharp white, snow-capped peaks cut the cerulean blue sky like an early 20th century Russian avant-garde painting, which quickly turns into a futuristic installation thanks to the SkyWay, that futuristic globular funivie that links the Italian lowland to Punta Helbronner, an overlord look out at 11,371 feet. The courageous will hike up Monte Bianc, ski across the glacier to Chamonix, France or heliski, whereas the rest of us are happy just to enjoy the view. I’d save the skiing for Courmayeur’s slopes, a network of what seems like a million pistes but what is in actuality 31 with lifts. Beginners please note that I am the definition of basic and spent a few days dedicated to Courmayeur’s smooth beginner trails. I organized private lessons, graduated from the bunny slopes, scared myself to death on the chair lifts, and got a great work out. I’ve learned that the best reason to ski in Italy are for the rifugi, the cosy mountain-ski chalets where eating is an art form. In the case of Courmayeur, the rifiugi are incredible and the food scene is even better. According to Courmayeur Mont Blanc’s official tourism site, there are twenty chalet-restaurants on piste- each with a different, very personal vibe, whether its gourmet cuisine or specialized, local Valdostan delicacies. Ski in to Chateau Branlat, a wooden chalet with beamed ceilings and funky decor, or snow mobile to La Chaumiere, a traditional Valdostan home built into the mountain. i discovered Maison Veille when I was lost skiing and need a restroom. The tiny igloo-like hut was cozy caffe that become a party spot in the evenings. Back in the town, tiny osterie and Michelin spots creep up in quiet corners, like Al Camin, a traditional osteria/trattoria and Petit Royal, the Michelin-starred restaurant at the Hotel Royal and its captivating La Tour, a private medieval tower with show cooking for couples. Superstar chef Heston Blumenthal fell in love with Courmayeur and combined his passion for food and skiing to create The Mountain Gourmet Ski Experience. Think of it as a three-day food fest with incredible Michelin-starred chefs, skiing and local cuisine. Pro tip: Everywhere I went accepted credit cards, but it can’t hurt to have a little cash for some of the mountain top rifiugi. Courmayeur is the kind of place where everyone skis hard, eats late, goes out late and then gets up incredibly early for another of skiing. The two best take home tips I discovered were that in order to love (and acclimate to) Courmayeur, you must drink a lot of water and get a non-consecutive days ski pass. Of all the amazing things you can do in Courmayeur, most of them revolve around snow- skiing, snow shoeing, ice skating, snow biking, snow kiting, et cetera, but Courmayeur also has a social life a few hundred meters below. For a bit of daytime culture, head to the Museo Alpino Duca deli Abruzzi, a two-level chalet home that houses the Alpine Museum that tells the history of mountaineering, its heroes, and the region, along with a small exhibition space showcasing photos of Valle d’Aosta’s traditional communities and events. Après Ski the Via Roma, Courmayeur’s thoroughfare and a windy street where all of the posh and quirky shops are located, as well as several caffe and cocktail spots. Courmayeur is small, so get out and explore Valle d’Aosta. The region is network of castles, and almost every weekend there is a traditional festival in the small towns. And then there are wonderful museums from archaeological and ancient remedies to planetariums and prisons. Museo Alpino Duca degli Abruzzi. Alpine Wine, showcased at Pavillon du Mont Fréty (the midway station to Punta Helbronner). So far, my experience has been at the Grand Hotel Royal e Golf, a beautiful yesteryear ski lodge looking out on the mountains, with a lovely outdoor pool. The vibe is a bit Grand Budapest Hotel with its fabulous decor, doormen and bellhops. Location is in smack in the middle of town which means it is not at all ski in/ski out but once I realized I didn’t need to a ride pistes, it was a short and charming walk through town to the pistes. Eventually I felt like everyone knew me. A second option is the tiny Bouton d’Or, a family-run property a few minutes walk from Courmayeur’s main square. for a ski in/ski out vacation, I have my eye on the very new Le Massif, member of Leading Hotels of the World. Last year, I had the opportunity for a hard-hat site visit, and it had me at hello due to its chic contemporary design, its location on top of the mountain and that damn terrace view (scroll back to the top). Evidence of me as a ski bunny. Getting to Courmayeur is quite easy. Airplane, rail, car, I’ve done it all and my experience, the easiest arrival is by car, once you’ve decided where you are coming from. Milanese will tell you to fly to Milan Malpensa MXP, and I agree, especially if you want to add on a few extra days for shopping. If you are a foodie, consider flying into Torino-Casselle TRN (or even Geneva GVA, if you have some banking to do). MXP and TRN offer bus shuttle service to Courmayeur but the least hassle is driving. Car rental services are always available or you can hire a driver service if you aren’t interested in exploring Italy’s smallest region. Getting to Courmayeur by rail is a bit of a pain, especially with gear. From MXP and TRN, you’ll shuttle to railway stations Milano Centrale or Torino Porta Nuova, then catch a regional train to Pré-Saint-Didier , and finally take a bus to Courmayeur ( SAVDA buses run from airport and train stations to Aosta and Courmayeur). Do the math: you’ll save more time and energy renting a car/hiring driver - approximately 1.5 hours from Torino and just under 2.5 hours from Milan. If you haven’t guessed, I am one of those people who loves every aspect of travel from planning and packing to airport perusing and arrival adventures, but I’d be kidding you if I didn’t tell you that my in transit experience is key to it all. Just the mere words in transit can stress out even the most expert of travelers - even more so during the holiday travel season when patience levels are at their lowest. Flight delays, seat issues, comfort concerns, inflight entertainment malfunctions or tired, already views films and tv shows- we’ve all been there. Enjoying an airport afternoon and flying off into the sunset requires just a little bit of prep, reliable wifi connection and my iPad mini, aka my best friend and its holy trinity of apps. Texture: Texture is the app world’s best kept secret. It’s monthly subscription magazine app that gives unlimited access to all of my favorite glossies- AFAR, Travel + Leisure, Women’s Health, National Geographic and so many more. Though I love a great print magazine, I love how they are re-interpreting themselves digital- with extra, multimedia content. Remember to download magazines in advance. 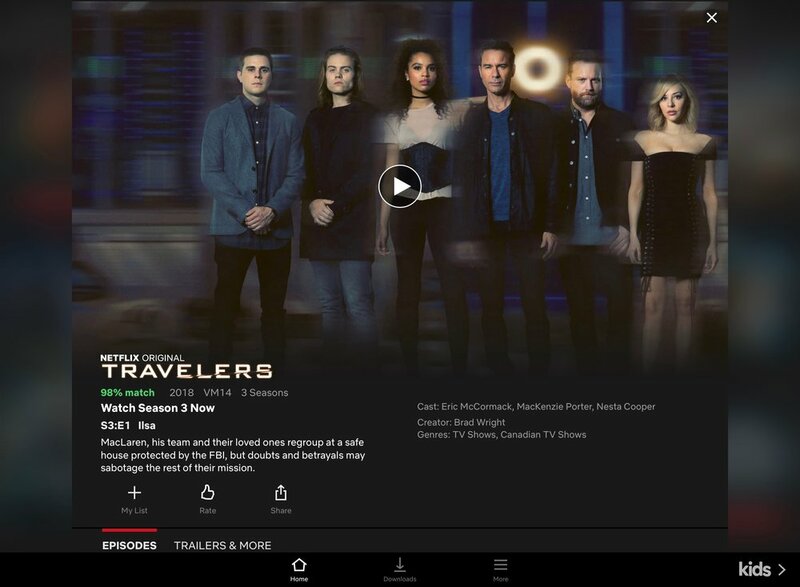 Netflix: Yeah, yeah, yeah, everyone knows Netflix but here’s the secret to Netflix and travel: season-spanning television series. Films (especially the cheesy ones) are great in flight entertainment but they can leave you wanting more which is while you’ll want to download multi-seasonal series. My latests fave are Versailles, three tawdry seasons of the Sun King, and the time travel triptych Travelers. Travel: In Situ Archaeologist Darius Arya’s travel podcast (yes, this is spousal sponson). Darius goes on location to the medina of Tunis, the agora of Athens or just the backstreets of Rome to talk contemporary travel and ancient history. The Trip: Roads & Kingdoms’s podcast uncorks a new bottle of travel, food, adventure and politics. You’ll want to open your own bottle for each episode. Amazon Music: I just discovered I can download playlists of any kind. Binaural beats to increase my brain waves. Meditation. 1980s hip hop. Enough said. Loading up an iPad with digital goodies is my ideal companion for any travel but what happens when I’m asked to put my devices away? If I’m lucky, I’ll have popped into Hudsons for a Read-n-Return book during my airport strut, but that’s only when I’m in North America- which means I better have one very strategic item in my bag, maybe two, for my Wheels Up ritual. Wheels Up ritual, you ask? Analog entertainment with a time limit that helps those painful minutes in tarmac purgatory pass by - in other words, a competitive distraction before take off. My Wheels Up ritual is simple: the crossword puzzle and/or sudoku from the inflight magazine must be solved before take off and for that, all I require is a fully sharpened pencil (Blackwing602) or a pen (Lamy Safari). Both are incredibly beautiful writing devices, but if necessary a Dixon Ticonderoga or Bic will suffice. When I’m feeling creative and my bag isn’t overloaded, I’ll bring a Rhodia notebook, which can be a miracle maker when traveling with children. Traveling light is my obsession, but I am willing to weigh down my carry-on with a few essential items that I know will upgrade my travel experience. External Battery Charger: I can never have too much battery support so I will always bring my Mophie Powerstation Plus. So far, Mophie has proven the most reliable and durable product I have ever used, and it packs a large charge by powering up both my iPad and iPhone. If you need to reanimate your MacBook as well, Mophie’s Universal USB-XXL is a life saver. Headphones: I’ve learned the hard way (ear aches, muffled sound, ambient noise) that not all headphones are created equal, and that quality headphones and sound filtering/noise canceling can transform my travel experience to sublime. Since I need headphones that will also block out my family as I work from home, Santa is bringing me Bose QuietComfort35 wireless II. Note to self: wireless headphones do not jack into the inflight entertainment. Sleep Mask: Sleep masks may have the reputation of being for the oh-so-spoiled, but a well-made sleep mask can project you out of your seat and into your podcast. The freebies will work, but for those willing to invest in self-indulgency for under $20, take a look at 40 Blinks. A few months ago, I realized that I didn’t have a carry-on. Well, I did. It just wasn’t mine, a fact pointed out to me by my husband when we were both packing for three-day trips in opposite directions. His faithful roller was like a best friend- kind of scruffy, always there, and able to keep lots of secrets. I had nada. So I shoved everything I needed into my polka dot shoulder bag, and what was left went into my daughter’s elementary school backpack. It was about time I invested in a proper carry-on of my own. Luggage, in my opinion, should be functional, durable and hopefully economical. A great suitcase should take you from destination to destination with ease, organization and maybe even a little security. For most of my life of long trips, I’ve used a banal black suitcase personalized with colorful, handmade luggage tags (i.e left-over ribbons). Yes, my bag always gets confused for someone else’s, and no, I don’t care that the suitcase itself is unattractive. In fact, aesthetics are last on my mind for two specific reasons: suitcases are always knocked around and scuffed up, and Roma-FCO, aka my main hub, is a black hole for luggage. But a carry-on? That’s an opportunity to style at airport lounges, flirt at the Duty Free shops and rock the runway, while having one’s entire life (or weekend life) neatly packed in a properly dimensioned bag at your side. Enter: AWAY Travel. Or better yet, enter my mom, an avid reader of tech and entrepreneur mags, who was fascinated with the direct-to-commerce start-up’s story, and insisted I needed to meet co-founders Steph Korey and Jen Rubio. 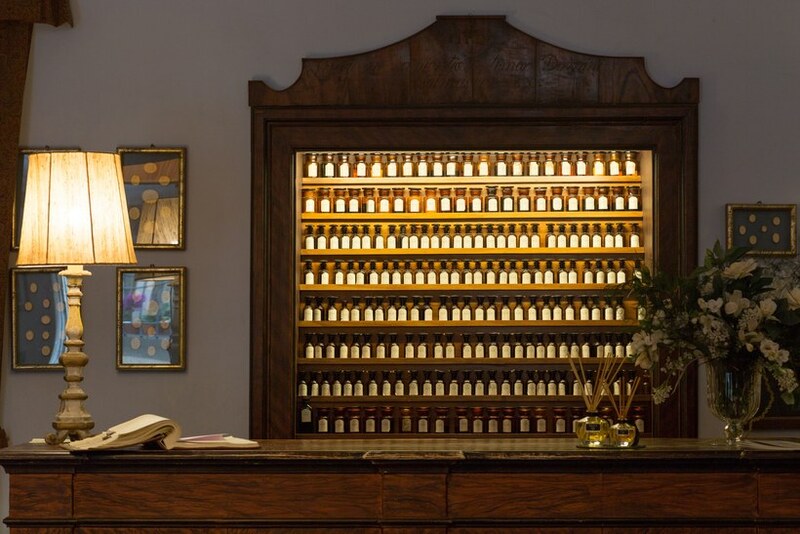 A meeting with them didn’t make it on the travel itinerary, but I did I visit AWAY’s Bond Street boutique in Manhattan - a tranquil showroom of light woods and whites which gets the point across: travel is meditation, and so should shopping. Only one wall is lined with the rainbow of polycarbonate suitcases in AWAY’s dark and pastel colors, while the floor features a bag or two to show off AWAY’s clever details like 360 wheels, compression pads, external pockets for laptops, ejectable battery chargers, and limited editions. Utilitarian with some perks like quarterly travel magazines, travel bags, packing cubes, tile luggage tags and personalization. I loved everything but it was the Bigger Carry-On, Aluminum Edition that came home with me. The Bigger Carry-On can hold quite a lot. It easily fit five days worth of clothing plus sneakers, sandals, summer homework books, computer, iPad, camera gear, make up bags and a few stuff animals for me and my 9-year-old on a mid-summer trip to Sicily. As an origami-style packing geek, I loved the compression pad, and was happy to shove shoes, toys, gear and the nylon laundry bag (stuffed with wet bikinis) on the zip half, aka b-side. The EF stickers, which I told my daughter were for Ever Flying, charmed everyone in the airport. We both loved the combination locks that give the carry-on a smart spy vibe. In the past two months, my carry-on has knocked around seven airports, several trunks and two train rides, so yep, it has some scratches and scuffs, but that adds personality. My only gripe is the weight (and I did choose to remove the charger) especially when packed for two. At 11.2 lbs, the Bigger Carry-On in unbreakable aluminum is heavier than its polycarbonate companion who weighs in at 7.8 lbs (or the smaller Carry-On 7.6 lbs). Maybe not the most logical choice for a peripatetic travel writer but the Aluminum edition is by far the prettiest. . The Bigger Carry-On, Aluminum edition and me on the Cayucos pier. Exterior measurements 22.7" x 14.5" x 9.6"
Interior measurements 20" x 13"
*At the time of writing this, the Carry-On dimensions were perfect (and still are) for Alitalia and Delta, my main carriers. It seems like every day, airlines surprise us with updated baggage policies. Check Luggagepro and SeatGuru, and then double check on your carrier’s site.